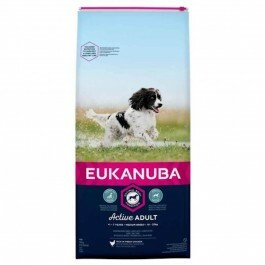 Eukanuba Adult Food for Medium Breeds supports your dog in performing optimally every day, by meeting all their nutritional requirements. Chicken is our primary source of protein, promoting the development of strong, lean muscles. It has been formulated with prebiotics and clinically proven beet pulp, to promotes digestive health and optimizes the absorption of all important nutrients. It also includes calcium for strong bones and a clinically proven antioxidant to ensure strong natural defences. To ensure that your adult dog looks and feels as great on the outside as they don on the inside, we have included an optimal ratio of omega-6 and -3 fatty acids. This is to help keep their skin healthy and their coat radiant. It has also been proven to help to reduce shedding by up to 80%*. This medium breed food was developed with veterinarians and is recommended by top breeders, it is 100% complete and balanced. *For dogs < 10kg we recommend to feed Adult Small Breed and for dogs > 25kg we recommend to feed Adult Large Breed.